Alison Search at 250-8880 or [email protected]. After your application is received and accepted, you will receive an advisor to guide you through registering for courses. The Doctorate in Education Systems Improvement Science, Ed.D. is designed to provide certified PK-12 practitioners, regardless of current job titles, positions, or content areas, with the opportunity to pursue an applied professional doctoral degree. Improvement science is an emerging field in education that has previously been used in business and in the medical fields. It is a specific method of inquiry that teaches practitioners to collect real-time data on programs and interventions to enhance replicability and improve results for students. The Ed.D. focuses on the practice and improvement of education, through systemic whole school reform, with an emphasis on addressing educational priorities as well as seeking specific strategic improvements in educational settings and student learning outcomes. 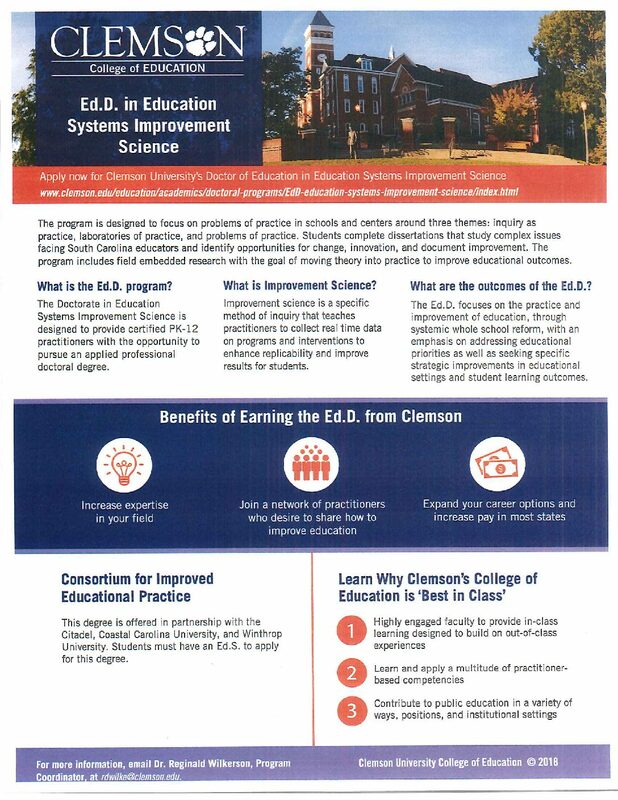 Admission requires the completion of an Education Specialist (Ed.S.) degree. New students are enrolled for Summer. Applications are due on March 1.